In a nutshell, Light Pollution is misdirected or misused light... generally resulting from an inappropriate application of exterior lighting products. Light Pollution comes in several flavors... each with its own negative effects. Light wastefully escaping into the night sky and causing a glow over urban/suburban areas. Light shining dangerously out into peoples eyes as they walk or drive by. Unwanted light shining onto a neighbors property or into their home. Billions of dollars annually in the United States. 5 to 10 billion depending on whose numbers you want to use. Incredible amounts of valuable natural resources. Hundreds of millions of barrels of oil... and hundreds of millions of tons of coal... just so people can light the bottoms of clouds? The air we breathe through needless generation of electricity (most of which comes from fossil fuels). See the previous comment about burning oil & coal. Air pollution is a serious problem that affects large segments of the population. Nocturnal wildlife. Many species won't even go near an area that has bad lighting. Also, many species will simply stop reproducing if habitat destruction from overly bright lights becomes too severe. Light Pollution currently threatens all Florida Sea Turtles. Humankind, being linked to some serious ailments. Light pollution is a threat to your health. This is serious! This can be thought of as second hand smoke in the 1970's. Researchers were just starting to look into the effects of second hand smoke back then. Many people laughed at the idea that one person could smoke and another person could be harmed. Today, we know that this is in fact the case. The views of the heavens that man has enjoyed since the beginning of time. 90% of all American live under skies that are "negatively impacted" by light pollution... while over half cannot even see the Milky Way from their homes. This is a shame. Mankind has throughout history looked to the stars to try to understand events around them. What Makes A Light Fixture Night Sky Friendly? Below are some examples of quality night sky friendly lighting. These Glare Buster fixtures are installed Geauga Park District facilities and they estimate an energy savings of about 70% by switching from the previous 150 watt HPS lights. You can click here to see other examples. All of these examples have similar characteristics. Light is directed downward... and not allowed to go up or out. Good quality, dark sky friendly lighting fixtures have been available for some time now. It's unfortunate that they've been so well hidden (until now, of course). Outdoor lighting is a fact of our modern lives. The least we can do is get it right. First up, you can decide if you're going to be part of the problem... or the solution. If you're visiting this website, you're probably aiming for the latter. Each one of us can contribute to the reduction of Light Pollution in our own ways. First, by making sure that our exterior lighting is ordinance compliant lighting. By this, is meant that they only light the ground beneath them... and never shine across onto a neighboring property... or into the night sky. Secondly, by making sure that your outdoor lights are only on when needed. By this, is meant that they're only on when there is activity in the area. Dusk to dawn lighting is to be strictly avoided. Thirdly, reduce the wattage of your bulbs. The human eye is remarkable in its ability to adapt to the amount of light present. Too much light can be overwhelming and glaring... actually reducing visibility. Even a small reduction in wattage will reduce light pollution. You might be surprised with how well you can see at night with a reduced wattage. Try it out and see what works for you. 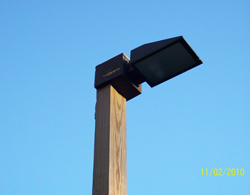 Check out these Outdoor Lighting Guidelines for a more detailed explanation.